Spring Lake Ranch, founded in 1932, is the creation of Wayne Sarcka, an immigrant from Finland, and his wife, Elizabeth Man, from Long Island. Wayne had worked in youth camps during World War I with shell-shocked British soldiers in Mesopotamia. Elizabeth, whose brother suffered from schizophrenia, had worked as a social worker in New York settlement houses, both for the Girl Scouts, and for the League of Nations Association. While hiking to Killington Mountain on their honeymoon, Wayne and Elizabeth came upon Spring Lake and were taken with its pristine beauty. A year later they purchased land that included Spring Lake and an old farmhouse. 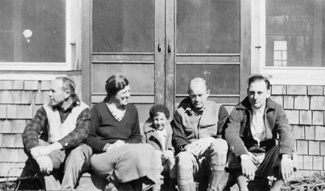 They went to work restoring the farmhouse and several summers later, with hopes of starting a summer camp, they took in several boys from New York City. The boys were put to work on the farm mending buildings, taking care of animals, and enjoying the outdoors. Wayne had learned the value of outdoor group work and play in helping young people develop their innate strengths to combat the trauma of war or a turbulent upbringing. Elizabeth's strong faith in the value of shared family life was, she believed, exemplified in the centuries old experience of the Gheel community in Belgium where, to this day, people with mental illness are taken into the homes of townspeople to share their lives. 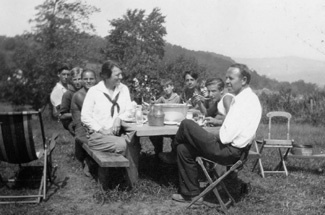 Their passion and obvious talents led their friend, Dr. Bernard Glueck, a prominent New York psychiatrist, to urge them to work with people with mental illness on their beautiful farm in Vermont. He had long believed in the need for alternative approaches to care for people with mental illness, who need time and space to come to terms with the effect of their illness and find new strengths to call upon. The Sarcka’s boldly accepted the challenge and Dr. Glueck and his colleagues began referring selected patients to them. Soon others with emotional problems came, and Spring Lake Ranch had begun. "We had our critics aplenty who found fault with us for sharing our lives with guests like that on equal terms… but I clung to wartime insights, and put tools in everybody's hands."